Judging by the Cover – 5/2/18 new releases – AiPT! Trevor and Eric share their favorite covers from the week’s new comics. Sana Takeda’s rich, highly detailed style is always a delight. The art of Monstress is the kind of high fantasy beauty I crave and this cover really hits the spot. It’s busy in the best way with tons of gorgeous, creepy details like the little eyes or how her fingers look like they’re unspooling. This series always catches my eye at my local shop thanks to these covers. Totally contrasting from the Takeda cover, Becky Cloonan’s Shade, The Changing Woman cover gives you all you need to know and nothing more. It’s Shade, the madness is everywhere, and it looks like she might be messing with her heart. The series is all about emotions and how they can often be more painful than worth it, so I already read a lot of foreshadowing in this cover thanks to its directness and simplicity. Two words: dancing skeletons! I love the contrasting art styles Sonny Liew chose for this cover. 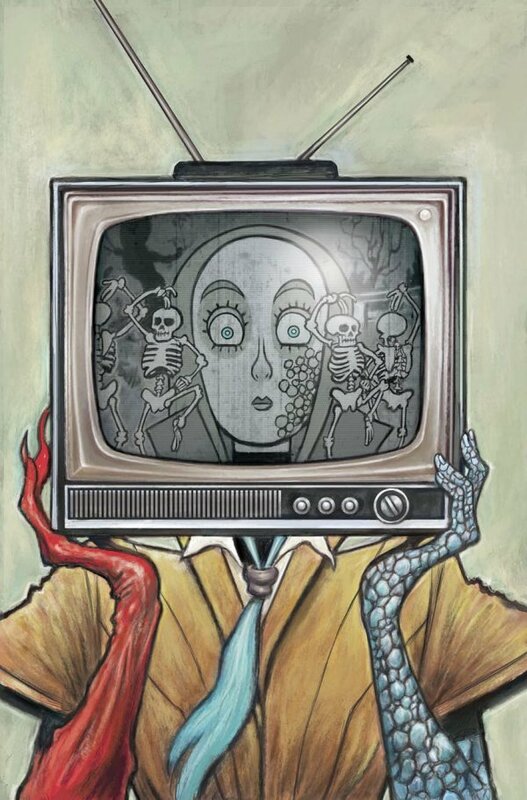 The old-school animation style keeps with Eternity Girl‘s recurring motif of referencing classic, campy television while also delivering a silly image that grabs the eye. It alludes to the theme of Thanatos in a ookie, spooky, kooky way that I love. I’m a big fan of both John Romita Jr. and Nightwing, so this cover is a double-win for me. The water is fantastic all around, from the downpour to the upward splash of Nightwing’s foot hitting the wet roof. I also love the added drama of Nightwing’s face enveloped in shadow. This piece is just technically sound all around, and I can feel the rain falling on the city. Damn. This cover creates such a striking mood, and Ben Caldwell makes it feel effortless (even though there’s obviously a ton of detail to the work). This image reflects the tone of despair that permeates through the series’ most compelling dramas. That shadow of a noose is just next-level eye-catching. I love over-the-top technological art and body horror, and Declan Shalvey and Jordie Bellaire do a good job combining the two here. The abundance of screens and wires is delightfully chaotic, and the fact that they’re all bursting from Nightwing’s eyes adds to the fun. This issue starts a new story arc, and if the plot is anywhere near as good as this cover is then the series has great things in store. Want to see your art featured in the next edition of Judging by the Cover? We’re now taking submissions for Fan Art of the Week. Contact us and show us what you’ve got.